It’s a simple, classic set-up: A group of explorers head out on an expedition to the mysterious Area X. They have gone through rigorous training that strips much of their identity in hopes of generating unbiased field reports. Instead, they are referred to simply by their scientific professions: Psychologist, Anthropologist, Surveyor, and Biologist. There was a Linguist too, but something happened to her. They are the twelfth expedition. Some of the prior expeditions have been successful. Others have ended in the death of every member on the team. Pretty soon, this latest expedition comes across something that’s either a tunnel or a tower – something that wasn’t on the maps in their briefings. There is, of course, something very wrong about this tower tunnel. Not long after exploring it, things start to go very wrong for the twelfth expedition. I’d say the fun starts here, but really – the terrifying fun starts pretty much right away. The expedition is out of its depth from the very first page – before they cross over the border into Area X. It quickly becomes clear that nothing about the expedition or Area X are as these scientists have been led to believe. It’s a simple, classic set-up, but it’s written by Jeff VanderMeer, so things are a unique level of intensely, wonderfully, WTFery weird. 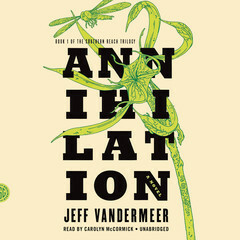 VanderMeer is simply an incredible writer, his prose popping like mushroom spores in your ears as he leads you in a delightful, dangerous daze across the mysterious, unexplainable landscape of Area X. It’s filled with invisible boundaries, spooky doppelgangers, strange creatures, and unexplainable events. It’s a primal story of coming to grips with a place impossible to understand – a place just as strange as ourselves. For all its weirdness, it’s incredibly accessible, and never dull. Carolyn McCormick was the narrator of the Hunger Games trilogy, and she does very strong work here. The story is told from the journal entries of the Biologist, and McCormick does an excellent job of coming across as a seemingly detached scientist on assignment, but secretly luring you in with just the right hint of inflections that cut beneath the surface, exposing you to a surprising amount of emotion: fear, love, longing, and the struggle for individuality. Annihilation is my new addiction. It’s as if The Company from Alien sent The Dharma Initiative into the Mountains of Madness. It’s an expedition into the bizarre, and I can’t wait to try and find my way back to the border. 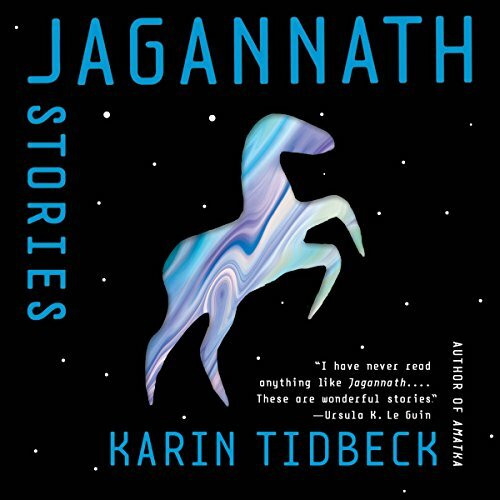 This entry was posted in reviews, Uncategorized and tagged annihilation, carolyn mccormick, jeff vandermeer, kaleidoscope of wtfery, southern reach trilogy. Bookmark the permalink. “It’s as if The Company from Alien sent The Dharma Initiative into the Mountains of Madness.” Wow, man. You nailed it.